This bronze Tua Peh Kong is a another wealth deity that is very popular among tycoons and businessmen in Asia. He is one of the Five Wealth Gods, in which the other four is in heaven but he is more special because he takes care of distributing money on earth. He is depicted sitting on his chair and he carries a big gold ingot (to multiply wealth) and a Ru Yi (to enhance authority and power). This item is most suitable for workdesks, wealth vases, receptions and cashiers. What Tua Peh Kong symbolizes and how to place the object? Tua Peh Kong (also known as God of Windfall) is another extremely popular God of Wealth especially in Southeast Asia (Singapore and its nearby countries). Most of the Buddhist and Taoist temples, homes and businesses in southeast Asia have his figure popularly worshipped by devotees. His presence signifies windfall luck, gambling luck, business luck, authority/high ranks, prosperity, excellent fortune and longevity. Some great politicians seek his advices to economy forecasts of districts or states. Most housewives would throng his temples for blessings before purchasing lotteries. Also known as God of Earth. He has five subordinates known as Gods of Wealth of Five Zones who are stationed at the East, South, West, North and Central zones. In order to have control over all the districts, this God of Wealth will help anyone whether he is good, evil, rich or poor, to manage his wealth so that it won't deplete easily. Among the five Gods of Wealth in which Civil God of Wealth, Military God of Wealth, Righteous God of Wealth and Rich God of Wealth are gods belonging to heaven, the Tua Peh Kong is a god of the earth. Whilst the heavenly gods distribute the wealth to individuals, he is the one controlling and passing it on to each individual. The Tua Peh Kong looks like an old rich grandpa who wears a gold robe of longevity on the throne and usually holds a Ru Yi to signify authority and wealth symbols (such as gold ingots or wealth pots) for good fortune. The Tua Peh Kong is also another good symbol of longevity. 1. Display the Tua Peh Kong in important areas of your business premise, office or living room. He can also be placed in reception, nearby metal safe, cashiers' counter to bring in more cash and lobbies. He should be facing the maindoor, but not necessarily facing out directly. He can be placed diaganolly as well. 2. Display Him in the southeast corner (wealth corner) of your homes or business premises. He can also be placed nearby your wealth ships to activate it. 3. 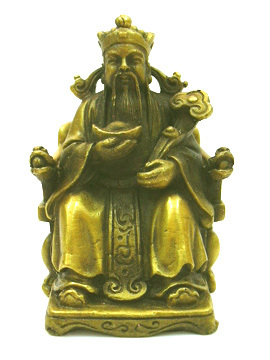 Display His image in your personal Sheng Chi direction to tap optimum energy for your career growth, good fortune luck and self development for long term success. 4. The Tua Peh Kong is an essential ingredient to set up wealth vases besides the Laughing Buddha. It is best to placed both the symbols in your vase for optimum results. Note: Kindly do not place the Tua Peh Kong in your bedrooms, toilets and kitchen.